I’m so excited to bring this special ebook to you! Earlier this year I had a crazy idea to rework a bunch of my first designs. I wanted to use new yarns and revamp a few things with the designs. I contacted one of my favorite yarn companies, Cascade Yarns to see what that thought and they were kind enough to let me use their yarns! The garments in this book have been favorites of mine for a while. I took some extra time to remake every single one until I was 100% happy with them. I kept them simple and am confident any one of them would make the perfect everyday, go-to garment for you or a special little lady in your life. There are very few seams and while there may be a few new to you stitches they are uncomplicated and easy to pick up. 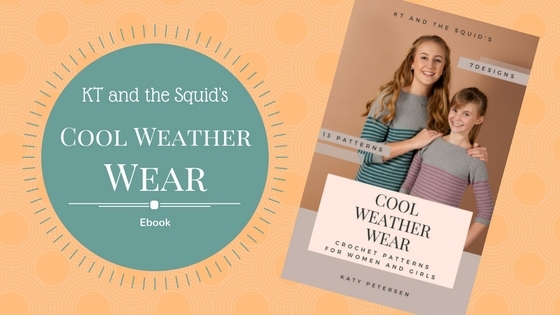 This ebook includes 7 total designs each in women and girl sizes for a total of 13 patterns! You can purchase the entire ebook for $19.99 HERE or each individual pattern for $4.99 (except the Labarre Cocoon Cardigan which is $3.49) and you can find the links to each pattern below. Now through 12/26/16 you can save 40% on each pattern or the entire ebook No coupon code needed! The wooden tags and buttons on these designs can be purchased from Angela’s Line on Etsy! The Ceres Pullover is the perfect top down sweater for your collection. Designed in a solid color or with stripes you can customize the look to fit your needs. Use Casdcade 220 Superwash for a soft and easy to care for sweater.This sweater is worked in the round and top down allowing you to try it on as you go, making it easy to get the perfect fit. The details are what give this project a modern twist. With a slightly longer bottom trim in the back you have a classic piece that fits today’s trends. Made up of an uncomplicated stitch pattern of extended single crochet and chains, giving it a mesh look makes it the perfect layering piece. To get more info or to purchase click HERE for the adult, click HERE for the girls. The Boisfort Top is a ¾ length sleeve, bottom up construction sweater made in one piece. Designed with stripes and a button detail on the sleeve this is an ideal everyday sweater. This sweater is made with Cascade Herritage 150 making it the ideal (buttery soft!) medium weight sweater for spring and fall. Because this top was designed with 6” of positive ease you can pick the right size for your bust for an oversized fit or go down a size for a more fitted top. The intermediate crocheter starting out making garments will find this pattern just right with the double crochet stitches and simple color changes. To get more info or to purchase click HERE for the adult, click HERE for the girls. The Calquato Vest is a cowl neck bottom up construction vest that is a great match over a t-shirt or button up shirt. Made with Cacscades 128 (an extremely soft, bulky weight yarn) this is a suitable project for the advance beginner crocheter. The yarn choice allows this pattern to be worked up quickly. The front pocket detail adds a sporty touch to the vest. To get more info or to purchase click HERE for adult, click HERE for girls. The Scheuber Pullover is a sporty, cowl neck sweater that is tailored to the intermediate crocheter. The herringbone double crochet stitch is used to create the subtle texture in the pullover and the use of Cascade’s Effects enhances the texture even more. Worked top down and in the round, there is no seaming (yay!). This pattern includes short row shaping in the cowl neck and a twisted cord drawstring. This sweater also features a slight increase of the bottom making for a more comfortable fit down to your hips. Expand your crochet skills with this sporty sweater. To get more info or to purchase click HERE for adult, click HERE for girls. The Millburn Pullover is a ¾ length sleeve pullover constructed top down and in the round. Designed with thin stripes through the body and sleeves and a solid yoke this is a basic sweater to add to your wardrobe. With 3 inches of positive ease and a slight increase down to the hips this will be your go to sweater when you want something comfortable and stylish. Made in Cascade 220 this classic sweater has a thick solid color trim on the sleeves and bottom of the sweater. To get more info or to purchase click HERE for adult, click HERE for girls. The Sholes pullover is a ¾ sleeve sweater designed with stripes in Cascade 220 Superwash. Working top down and in the round allows you to try on the sweater as you go, getting the perfect fit. The button detail at the neck gives the finished sweater an unexpected twist. Along with the striping, the pattern is written using the herringbone double crochet stitch which provides a subtle texture and interest to the finished sweater. The unexpected details continue in the bottom trim of the sweater with a slight cinching on the sides. To get more info or to purchase click HERE for adult, click HERE for girls. The Labarre Cocoon is an ideal first garment project for any crocheter. This cardigan was designed to fit a wide range of sizes so there’s no guessing on size! It is constructed as a large rectangle and then seamed up the sides to create the flowy sleeves, there is no shaping to figure out. Once the piece is together a simple trim is added around the outside to polish off the look. The cocoon is designed with Cascade Tangier which a self striping yarn to provide interest to the extended single crochet pattern. To get more info or to purchase click HERE.